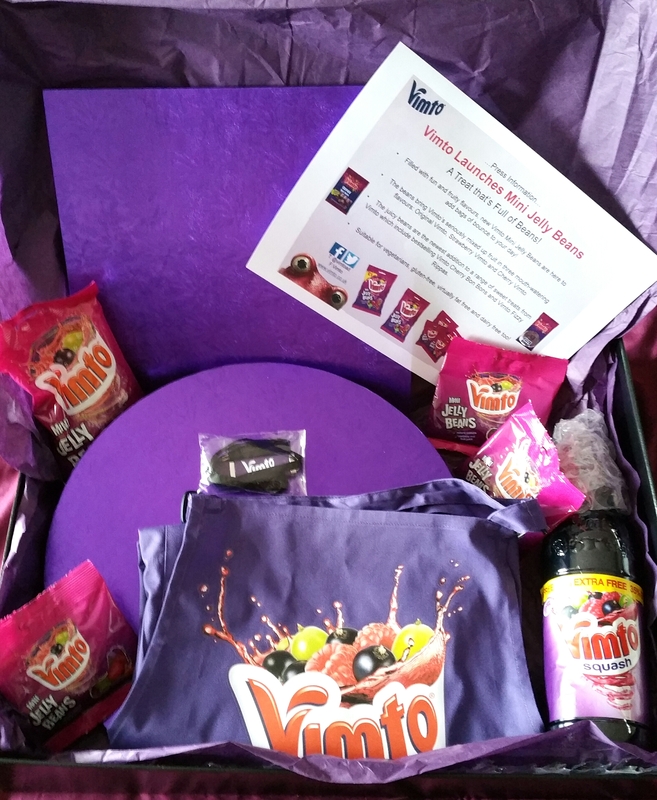 I was recently very lucky to receive a parcel full of Vimto goodies, including their new Mini Jelly Beans. Strawberry, Cherry and Original Vimto flavours all in one packet. They are dairy free and made with real fruit juice, and are suitable for vegetarians. These were absolutely scrumptious. We all love Vimto in my house so this was a wonderful parcel to receive! With the Great British Bake Off in full swing, the nation has gone in to baking frenzy. One of my favourite things to do is bake with my 9 year old son Luke. I’m a firm believer that baking with children is a vital activity. It gives them skills that will be so beneficial to them later in life and also is an unbelievably fantastic bonding pastime. When I was a child my Mum was too ill to bake, so I missed out on this. I was determined I would bake with Luke and he really enjoys it. I think too of a BBC film I saw that has really stuck in my head since watching it: Toast, which is a biography of the famous chef Nigel Slater. The scene that haunts me is when, as a child Nigel kept asking if he could bake mince pies for Christmas with his Mum but she kept saying no. Then a couple of weeks before she usually made them she took him into the kitchen and made some with him, as she knew she was dying and this would be her only chance. That memory has stayed strong with him, and the scene has stayed strong with me. I don’t mean this post to be sorrowful, I just want to express how something as simple as baking with family can have such a lasting impression on their lives. Preheat the oven to 200C/180C Fan. Line 2 baking sheets/trays with baking paper. Place the flour and butter into a bowl and rub together using your fingertips until the mixture resembles breadcrumbs. Add the caster sugar and Jelly Beans and stir it together. Pour in the egg and milk and mix well together, making sure the Jelly Beans are evenly distributed. The mixture will be very stiff. Use a spoon to place 10 heaped mounds on to the baking sheets, 5 on each. Place them well apart as they do spread out! Bake for 15-20 minutes until golden brown and nicely risen. Cool on a wire rack. Enjoy! As you can see, they really are easy to make and your children will love them. They will also feel so proud that they created something so yummy. Most children love getting a bit messy, so their sticky hands from rubbing the flour and butter together will be so satisfying for them. And believe me, they’ll remember the experience a lot longer than you could imagine! We also used the goodies to decorate a delicious cake. Use your favourite sponge cake recipe to make the cake of your choice (we made a vanilla cake) and mix Vimto cordial into stiff buttercream to taste. The Vimto will make it go lovely and fluffy. Fill your cake with it, smooth some round the side, and pipe a circle on the top edge. 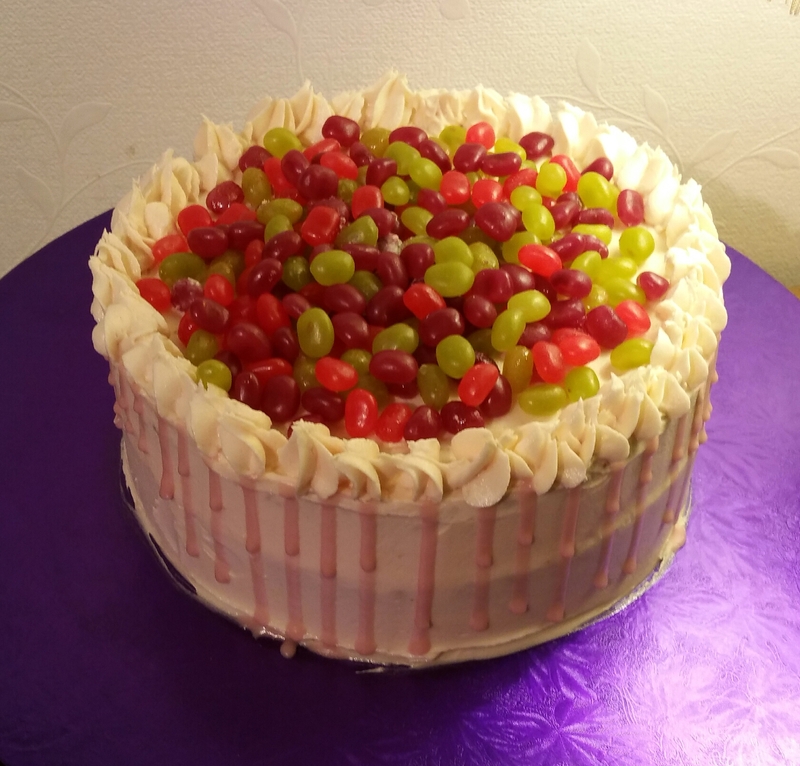 Pour some Mini Jelly Beans on to the top to cover. If you want you can mix icing sugar and a small amount of Vimto together until it coats the back of a spoon nicely. Put this into a disposable piping bag and snip off the very tip. Pipe a small blob of icing on to the top edge and let it run down the side. Repeat at regular intervals all around the cake. I have to say, Vimto buttercream is now a favourite in this house! Not too strong but enough to taste it. Perfect. If you want to try Vimto Mini Jelly Beans for yourself (and I strongly recommend that you do as they are moreishly addictive) you can buy them in individual serving packs or in family sized packs,from Nisa, Poundland, Home Bargains, some Tesco stores, among other shops. TOP TIP… Buy more than you need. 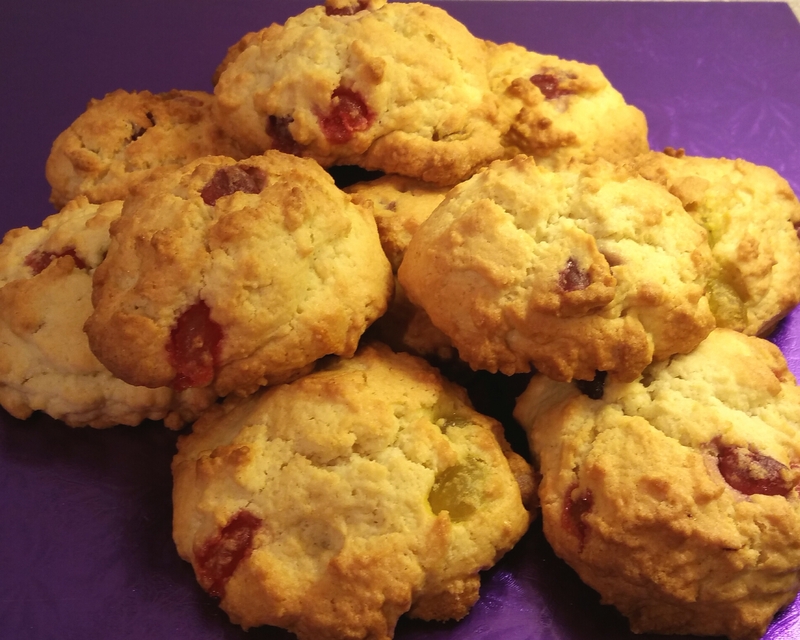 It is impossible to not eat a whole packet one or two extra as you make the rock cakes. DISCLAIMER: I received the Jelly Beans and Cordial for free to use in baking. All ideas and views are my own and I am always honest in my opinions.